A Palestinian official report monitored 30 violations against Palestinian pressmen at the hands of Israeli forces as well as Palestinian Authority forces in June, 2015. According to the report, which was issued on Thursday by the Palestinian Ministry of Information in Gaza, the month of June witnessed over 20 offenses against Palestinian journalists by Israeli forces in an attempt to prevent them from documenting the Israeli aggressive practices against Palestinians. 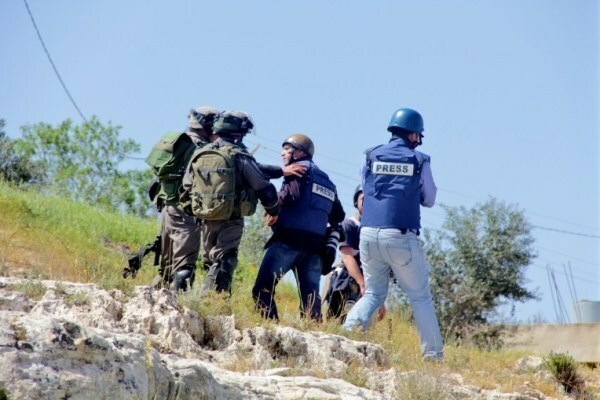 The Israeli assaulting of Palestinian workers in the field of journalism included arrest, humiliation, assaulting, threats, breaking into houses, confiscation of press equipment, prevention from taking photos of events and activities and barring from travel. The Palestinian Authority’s violations included arrests and summonses of four Palestinian pressmen including Ayman al-Sayeh who is suffering from a serious disease. Israeli forces have continued with systematic attacks against Palestinian civilians and their property in the occupied Palestinian territories (oPt) for the reporting period of 26 June- 01 July 2015. In the west Bank, Israeli forces killed a Palestinian civilian at al-Hamra checkpoint in the Jordan Valley and wounded 2 others, including a child. Additionally, Israeli forces continued to use force against Palestinian civilians participating in peaceful protests in the oPt and against civilians approaching the border fence along the Gaza Strip. In the West Bank, on 26 June 2015, Israeli forces stationed at al-Hamra checkpoint, south of Tubas, killed a Palestinian civilian from al-Ouja village, north of Jericho. They claimed that an armed Palestinian in a vehicle fired at Israeli soldiers stationed at the said checkpoint, but no casualties were reported. However, Israeli soldiers fired in response and seriously wounded him, due to which he died. On 30 June 2015, Israeli forces stationed at Qalandia checkpoint, north of East Jerusalem, opened fire at a Palestinian civilian who cries out "Allah Akbar" while being near the checkpoint. As a result, he sustained 5 bullet wounds throughout his body. Israeli forces continued to use excessive and systematic use of force against peaceful protests organized by Palestinian civilians and Israeli and international human rights activists in protest at the construction of the annexation wall and settlement activities in the West Bank and Israeli policies in the oPt. As a result, a 14-year-old child sustained a bullet wound to the right thigh in Kufor Qaddoum protest, northeast of Qalqilya. In the Gaza Strip, in the context of targeting border areas, on 25 June 2015, Israeli forces stationed along the border fence, east of Jabalia, opened fire sporadically at the cemetery area, but no casualties were reported. On 01 July 2015, Israeli forces stationed along the border fence opened fire at agricultural lands, east of al-Maghazai refugee camp, but no casualties were reported either. As part of targeting fishermen, Israeli gunboats stationed off Deir al-Balah shore, in the central Gaza Strip, opened fire at Palestinian fishing boats sailing within 3 nautical miles, but no casualties were reported. During the reporting period, Israeli forces conducted at least 41 military incursions into Palestinian communities in the West Bank and 6 ones in East Jerusalem. During these incursions, Israeli forces arrested at least 33 Palestinians, including 10 children. Eleven of these civilians, including the 7 children, were arrested in East Jerusalem. In the Gaza Strip, on 01 July 2015, Israeli forces conducted a limited incursion into the east of al-Qarara village, east of Khan Yunis in the south of the Gaza Strip. They levelled lands along the border fence and withdrew few hours later. The illegal closure of the Gaza Strip, which has been steadily tightened since June 2007 has had a disastrous impact on the humanitarian and economic situation in the Gaza Strip. The Israeli authorities impose measures to undermine the freedom of trade, including the basic needs for the Gaza Strip population and the agricultural and industrial products to be exported. For 8 consecutive years, Israel has tightened the land and naval closure to isolate the Gaza Strip from the West Bank, including occupied Jerusalem, and other countries around the world. In the context of collective punishment policies, on Wednesday morning, 01 July 2015, Israeli forces locked with metal boards the windows and doors of a house belonging to the family of Odai Abu al-Jamal in al-Mukaber Mount village, southeast of East Jerusalem, after evacuating the family. On 24 June 2015, Israeli forces issued notices to halt construction works and to demolish civilian objects in Kherbet Janaba, east of Yatta south of Hebron. On 27 June 2015, 3 Israeli settlers from "Mitzpe Yair" settlement, east of Yatta south of Hebron, attacked a 53-year-old Palestinian civilian with stones and tried to physically attack him. As a result, he sustained wounds to the head and pain in the back. On 27 June 2015, a number of settlers beat and insulted a 31-year-old Palestinian civilian while driving his car on Beit Hanina new road, north of East Jerusalem. As a result, he sustained bruises and wounds. On 30 June 2015, 4 masked settlers from "Dulip" settlement, northwest of Ramallah, sprayed pepper spray over the face of a 60-year-old Palestinian civilian and attacked him with sticks, sharp tools and stones. On the same day, a group of settlers wrote racist slogans against Arabs on the walls of a number of houses in Beit Safafa village, south of East Jerusalem. The slogans included: "Arabs should be slaughtered". During the reporting period, Israeli soldiers used excessive force against peaceful demonstrations organized by Palestinian civilians, international and Israeli human rights defenders in protest at the construction of the annexation wall and settlement activities in the West Bank. As a result, a Palestinian child sustained a bullet wound to the right thigh during Kufor Qaddoum protest, northeast of Qalqilya. Following the Friday prayer on 26 June 2015, dozens of Palestinian civilians and international and Israeli human rights defenders organized a peaceful demonstration in Bil’in, west of Ramallah, in protest at the construction of the annexation wall and settlement activities. The protestors marched by the annexation wall and tried to cross the fence. Israeli soldiers stationed behind the wall, in the western area, and a large number of soldiers deployed along it, fired live bullets, tear gas canisters, rubber-coated metal bullets, sound bombs and wastewater at them and chased them into the olive fields. As a result, a number of protestors suffered tear gas inhalation and others sustained bruises as they were beat up. Also following the Friday prayer, Palestinian civilians organized a protest against the closure of the eastern entrance of Kufor Qaddoum village, which has been closed by Israeli forces since the beginning of the al-Aqsa Intifada. Once the protestors approached the closed entrance, Israeli forces fired rubber-coated metal bullets, tear gas canisters and sound bombs. They also sprayed skunk water over the protestors. As a result, a number of protestors suffered tear gas inhalation and others sustained bruises as they beat up by Israeli soldiers. Following the afternoon (al-Asr) prayer on Saturday, 27 June 2015, Palestinian civilians organized a protest against the closure of the eastern entrance of Kufor Qaddoum village, which has been closed by Israeli forces since the beginning of the al-Aqsa Intifada. Once the protestors approached the closed entrance, Israeli forces fired rubber-coated metal bullets, tear gas canisters and sound bombs. They also sprayed skunk water over the protestors. As a result, Abdul Elah Abdul Mahdi Ali Mohammed (14) sustained a bullet wound to the right thigh. Note: the protest of Kufor Qaddoum was scheduled twice a week (following the Fridays' prayer and following al-Asr prayer on Sundays). · Hebron: Israeli forces established 9 checkpoints all over the city. On Thursday, 25 June 2015, Israeli forces established 2 checkpoints at Mothalath al-'Aqabah between Dura and its southern villages, south of the city and at the entrance of Bani Na'im village, east of Hebron. On Friday, 26 June 2015, Israeli forces established a checkpoint at the entrance of Ethna village, west of the city. On Saturday, 27 June 2015, Israeli forces established a checkpoint at the entrance of al-Thaheriyah village, south of Hebron. On Sunday, 28 June 2015, Israeli forces established two checkpoints at the south-eastern entrance of Hebron and at the entrance of Beit Kahel village, northwest of Hebron. On Monday, 29 June 2015, Israeli forces established a checkpoint at the entrance of Sa'ir village, east of Hebron. On Wednesday, 01 July 2015, Israeli forces established two checkpoints at the entrance of al-Tabqah village and on 'Oyoun Abu Seif road, south of Dura, southwest of the city. · Ramallah: Israeli forces established 26 checkpoints all over the city. On Thursday, 25 June 2015, Israeli forces established 2 checkpoints at the entrance of 'Aboud village, northwest of Ramallah and at the entrance of Termes'aya village, north of the city. On Friday, 26 June 2015, Israeli forces established 5 checkpoints at the eastern entrance of al-Nabi Saleh village and closed the iron gate established at the entrance preventing civilians from entering or leaving through it; the entrance of Ni'lin village; under the bridge of Yabrud village, northeast of the city; at the intersection of Beit 'Oar al-Foqa, southwest of the city and Deir Abu Mash'al villafe, northwest of the city. On Saturday, 27 June 2015, Israeli forces established a checkpoint at the entrance of Ras Karkar village, northwest of Ramallah while they established two checkpoints at each of the following village entrances: Beitin; 'Ein Yabrud and Selwad, northeast of the city. On Monday, 29 June 2015, Israeli forces established 10 checkpoints in each of the following areas: at the entrance of Termes'ayah village, at the entrance of Kherbtha Bani Haris village; under the bridge of Yabrud village; Deir Abu Mash'al village; at the intersection of Beit 'Oar al-Foqa village; the entrances of Selwad village; the road between the villages of Beitin and 'Ein Yabrud; the road between Deir Jarir and Kafr Malek; the road between the villages of Kafr Malek and Kherbet Abu Falah; and the road between al-Mogheir and Termes'ahya villages. On Tuesday, 30 June 2015, Israeli forces established two checkpoints at the entrance of Ras Karkar village, northwest of Ramallah and the entrance of 'Ein Yabrud village, northeast of the city. On Wednesday morning, 01 July 2015, Israeli forces closed the road from Ramallah to al-Jalazone refugee camp adjacent to Beit Eil settlement with cement cubes. · Qalqilya: Israeli forces established 3 checkpoints all over the city. On Monday, 29 June 2015, Israeli forces established a checkpoint at the entrance of Kafr Qaddoum village, northeast of Qalqilya. On Tuesday, 30 June 2015, Israeli forces established 2 checkpoints at the entrance of Jeet village, northeast of Qalqilya; on the road between 'Azoun and Jayous villages, east of the city. · Jericho: Israeli forces established 4 checkpoints all over the city. On Friday, 26 June 2015, Israeli forces established 2 checkpoints at the entrance of al-'Oja village, north of the city, and at the southern entrance of Jericho. On Monday, 29 June 2015, Israeli forces established 2 checkpoints at the entrance of al-'Oja village, north of the city, and at the southern entrance of Jericho. At approximately 14:00 on Friday, 26 June 2015, Israeli forces established a checkpoint at Mothalath al-Shuhadaa', south of Jenin. They arrested Ahmed Tawfiq Raja al-Qereini (19) from Jenin refugee camp adjacent to Jenin while passing through the checkpoint and took him to an unknown destination after removing the checkpoint. At approximately 14:00 on Saturday, 27 June 2015, Israeli forces deployed in the Old City in the center of Hebron arrested Hamdi Mohammed Abu Hamdiyah (19) after stopping him at the entrance of al-Ibrahimi Mosque. At approximately 14:00 on Sunday, 28 June 2015, Israeli forces arrested Fatmah Naser Mesleh Nazzal (42) from Qalqilya while trying to sneak into Israel via a hole in the annexation wall near Qalqilya. Israeli news websites reported that Israeli forces arrested the aforementioned woman, who had a hunting rifle, while she was trying to sneak into Israel. At approximately 02:00 on Monday, 29 June 2015, Israeli forces established a checkpoint on the main road between Tulkarm and Qalqilya near the eastern entrance of Jbarah village. The Israeli soldiers stopped a Palestinian car travelled by Belkheir 'Isam Fayeq Qonbor (23) from tulkarm and arrested him taking him to an unknown destination. At approximately 12:40 on the same Monday, Israeli forces stationed at "Qobet Rahil" checkpoint near Belal Ben Rabah Mosque, north of Bethlehem, arrested Maysoun Mousa Mousa (19), from al-Shawawrah village east of the city, and took her to an unknown destination. Israeli forces claimed that the aforementioned girl stabbed an Israeli female soldier at the checkpoint. At approximately 10:00 on Tuesday, 30 June 2015, Israeli forces stationed at al-Jalamah checkpoint, northeast of Jenin, arrested Moayad 'Omer Ahmed al-Sa'adi (31) when he was near the checkpoint area claiming that he attacked the Israeli soldiers with fireworks. The aforementioned civilian was released later after Israeli forces was ascertain that he is mentally ill.
At approximately 16:30 on Tuesday, 30 June 2015, Israeli forces stationed at Qalandia checkpoint, north of East Jerusalem, opened fire at a Palestinian civilian, who cried out "Allah Akbar", when he was near the checkpoint. As a result, he was wounded. An eyewitness said to a PCHR fieldworker that Israeli forces stationed at Qalandia military checkpoint opened fire at Hassan Ayoub Abu Ermaila (21), from Beit Hanina neighbourhood, north of the city, after he suddenly cried out "Allah Akbar" near the aforementioned checkpoint. As a result, he sustained 5 bullet wounds throughout his body and was taken to "Tsha'ri Tsedeq" Hospital in West Jerusalem to receive the necessary medical treatment. His health condition was serious. · In the context of collective punishment policies adopted by Israeli forces against Palestinian families of persons accused of being involved in resistance acts against them, Israeli forces locked up on Wednesday morning, 01 July 2015, the doors and windows of a house belonging to the family of Odai Abu al-Jamal in Jabal al-Mukaber village, southeast of East Jerusalem, using metal plates after evacuating the family. An eyewitness said to a PCHR fieldworker that Israeli infantry units moved into the village. They deployed in the neighbourhoods and then raided the yard of Ghassan and Odai Abu al-Jamal's houses, during which a helicopter was hovering overheads. The witness added that Israeli forces closed 3 entrances of the village and it was like a curfew. He said that Israeli forces raided the house of Odai and evacuated the 6-member family. They banned the Abu Jamal family and other neighbours from approaching. They threw the furniture and clothes out of the house and closed the windows and doors with metal plates. It should be noted that Odai's family house that was built in 1936 was resided by his father, mother, sister and 3 brothers. At approximately 22:00 on Thursday, 25 June 2015, Israeli forces raided and searched a house belonging to the family of Ayed al-Taweel (40) in Beit Hanina neighbourhood, north of East Jerusalem. They arrested the aforementioned person and his 2 children, Saif (15) and Zaid (16), and took them to an unknown destination. At approximately 23:00 on the same day, Israeli forces raided and searched a house belonging to the al-Taweel family in Ras al-Amoud neighbourhood in the east of the old city in East Jerusalem. They arrested Obaida Salman al-Taweel (25) and took him to an unknown destination. At approximately 23:30, on the same day, Israeli forces raided and searched a house belonging to the family of Essa Qotob in al-Khelleh neighbourhood in the east of East Jerusalem. They arrested his son Mohammed (13) and took him to an unknown destination. At approximately 23:30 on Saturday, 27 June 2015, Israeli forces moved into a number of neighbourhoods in the old city in East Jerusalem. They raided and searched some houses from which they arrested 3 children: Yazan Abdullah Ayoub (14), Mostafa al-Deb'i (16) and Ameer al-Deb'i. At approximately 16:00 on Sunday, 28 June 2015, Israeli forces raided and searched 2 houses belonging to the families of Ghassan and Odai Abu Jamal and questioned their families. Members of the Abu Jamal family said that Israeli undercover units accompanied by an officer raided and searched the 2 houses belonging to the Abu Jamal. They added that Israeli forces questioned members of the 2 families on the spot. They also photographed all the family members without saying why. Israeli soldiers asked in particular about the children of Ghassan, Walid, Salma and Mohammed, and photographed them as well. Israeli forces photographed the houses belonging of the family from inside and outside and the roads leading to them. They added that an Israeli officer threatened before leaving that they would always raid the 2 houses. It should be noted that Ghassan and Odai Abu Jamal carried out an attack on an Israeli synagogue near Deir Yassin, west of Jerusalem, on 18 November 2014 that resulted then in killing 5 Israelis. At approximately 14:00 on Sunday, 28 June 2015, Israeli forces arrested Ahmed Jasem Shweiki (10) while he was around his family's house in al-Thawri neighbourhood in Silwan village, south of the old city in East Jerusalem. They took him to Saladin police station. Shweiki's father said that Israeli special units arrested his child when he was playing with his friends around his house. He added that his child was referred to the police station to be questioned, where he remained in detention from 14:00 to 17:00. Israeli forces did not allow any of his family members to attend the investigation. The father was only allowed one hour and a half after interrogation. Jasem said also that he learnt about the detention of his child from the neighbours not from the Israeli authorities. At approximately 04:00 on Tuesday, 30 June 2015, Israeli forces raided and searched a house belonging to the family of Essam al-Kord (45) in al-Sa'diya neighbourhood in the old city in East Jerusalem. They arrested him and his son, Tareq (19), and took them to an unknown destination. On Monday morning, 29 June 2015, officers from the Israeli municipality and Nature Authority distributed maps and decisions signed by the head of the Israeli municipality on lands in al-Eisawiya village, north of East Jerusalem. The decisions and maps showed that dozens of agricultural dunums would be planted with trees to be turned into a public park. Mohammed Abu al-Hommos, member of the follow-up committee in the village, said that decisions were distributed regarding al-Eisawiya lands. According to the maps, the Israeli municipality plans to plant more than 200 dunums to make them a public park. He added that the lands are located within the settlement plan "National Park Plan 11092" in al-Tour Mount and al-Eisawiya village. This plan was cancelled by the Israeli district planning and construction committee last year because the committee required meeting the needs of people, including, schools, kindergartens, houses and health care centres, before establishing a public park in that place. It should be noted that the threatened lands are the ones remaining for the village's residents to meet their natural growth. Abu al-Hommos added that the Israeli municipality and nature authority, according to the decision left on the lands, claim that those lands are not used by their owners and thus they would be used for the interest of the public. He rejected the Israeli claim and stressed that parts of the lands were planted with trees tens of years ago and other lands were levelled by Israeli bulldozers. At approximately 21:00 on Saturday, 27 June 2015, a number of Israeli settlers beat and insulted Ibrahim Dawood al-Alami (31) while driving his car on Beit Hanina road, north of East Jerusalem. As a result, al-Alami sustained bruises and wounds, due to which he was taken to Hadasa Hospital to receive the necessary medical treatment. "While my brother Ibrahim, who works as a driver in an Israeli transport company, was going to his work in West Jerusalem, he took Beit Hanina new road, where 3 settlers intercepted his car. They surrounded his car and then asked him: 'Are you an Arab?' he answered: 'Yes'. The settlers cursed him with abusive and racist words and then beat him severely. Moreover, one of settlers tried to strangle him with his hands. Consequently, Ibrahim Dawood was wounded in the chest and face. The settlers fled after my brother was able to defend himself. After that, he continued driving his car and went to work in the company. Signs of assault were clear on him. As a result, the manager of company called the police that investigated the incident and brought an ambulance to take al-Alami to Hadassah Hospital for medical treatment." At approximately 06:00 on Tuesday, 30 June 2015, a group of settlers wrote racist slogans against Arabs on the walls of a number of houses in Beit Safafa village, south of East Jerusalem. An eyewitness said to a PCHR fieldworker that Beit Safafa residents were surprised on the day to see racist slogans against Arabs on the walls of some houses in the village. Of the written slogans were: "The Arab blood is vulnerable to attack", "Arabs should be slaughtered" and others. At approximately 09:00 on Thursday, 24 June 2015, Israeli forces accompanied by an Israeli Civil Administration vehicle moved into al-Deirat village, east of Yatta, south of Hebron. They stationed in the center of the village, where the civil administration officer handed Salah Mohammed Ahmed Mohammed (39) a notice to demolish his 100-square-meter, under-construction house under the pretext it was not licensed. It should be noted that Israeli forces handed the same person a notice to halt construction works on 13 April 2015. 9. A 35-square-meter residential room belonging to Essa Yunis Abu Yunis. The notices gave them a deadline on 23 July 2015 to refer to the competent departments in the Israeli courts. 3. A 35-square-meter residential room belonging to Essa Essam Yunis. Othman Jabarin, director of Mosafer Yatta Protection Society, said to a PCHR fieldworker that the distribution of notices was meant to dismiss civilians from their lands, especially as Israeli authorities classify Kherbet Janaba as a shooting area. Moreover, the civil administration officer confiscated a power generator and a manual digger that was used by the Palestinians civilians to fix the dirt road leading to their area. At approximately 14:00 on Thursday, 25 June 2015, 15 settlers from "Kiryat Arba" settlement, east of Hebron, demolished a part of a water well belonging to Abdul Karim Ibrahim al-Ja'bari that was established 60 years ago. They threw big rocks over the well, due to which the upper part was damaged. 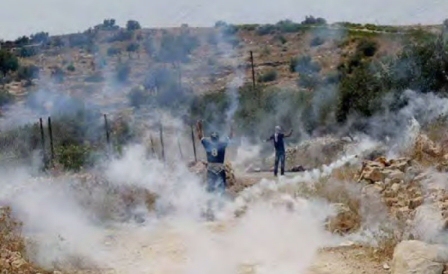 At approximately 19:30 on Saturday, 27 June 2015, 3 settlers from "Mitzpe Yair" settlement, east of Yatta, south of Hebron, attacked Ziad Mohammed Yunis Makhamra (53), from Kherbet Beer al-Add, with stones. They tried to physically attack him. As a result, he sustained wounds to the back of the head and pains in the back. He was then transported to Abu al-Hassan al-Qasem hospital in the city. "I work in the field of livestock breeding, and live in Khirbet Bir Alaad which is about 17 kilometers in east of Yatta town, Southern Hebron. At the beginning of 2000, many families were expelled by Israeli force, claiming that the area was a closed military zone. After 6 years, Israeli court issued an order to allow people to return to their land (Kherba). At that time, my family and I returned to the Kherba and another family too, and we stayed there so far. On Thursday, 27 June 2015, at approximately 7:30, I went on foot to Ma'in area which is about 5 kilometers from the Bir Alaad. My relatives sent to me an invitation to Ramadan breakfast. I contacted my son, Mohammed, 25, to take me there. While I was walking on the dirt road leading to the settlement of "Mitzpe Yair", I saw three settlers coming to the main gate of settlement. When I arrived to the gate, I met the three settlers. They surrounded me and tried to take my stick, but I refused. I walked back and called my son, Mohammed, again in order to come quickly. After that, I ran quickly to the dirt road, the settlers chased me and hit me by stones, I was wounded in my back, head and left thigh. Moments later, and the car of my son arrived. After that, the settlers fled into the settlement. My son Mohammed took me to Ma'in area, where they provided me first aid. I was transferred to Abu al-Qasim al-Hassan Hospital to conduct some medical tests and x-ray. In the end, they gave me the appropriate treatments." At approximately 18:45 on Tuesday, 30 June 2015, 4 masked settlers from "Dulip" settlement, northwest of Ramallah, sprayed pepper spray over the face of Mahmoud al-Haj Hassan Nofal (60) and attacked him with sticks, sharp tools and stones. The aforementioned person was ploughing his land in al-Aqaba area, southwest of Ras Karkar village, when he was attacked. 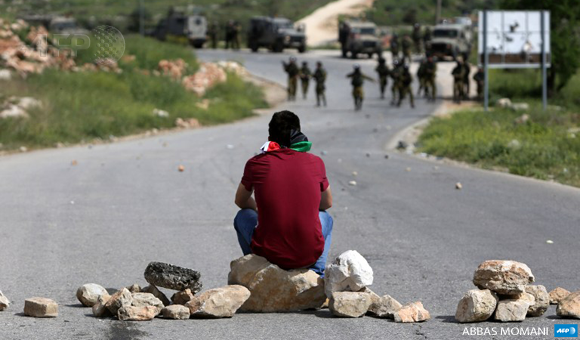 A Palestinian youth sits on stones facing Israeli forces during clashes following a demonstration against Palestinian land confiscation to expand the nearby Jewish Hallamish settlement on March 28, 2015 in the West Bank village of Nabi Saleh. Defense for Children International Palestine filed complaints on behalf of two children to the Israeli Military Police Criminal Investigations Division last week. Both Abdel-Rahman S., 15, and Anwar M., 17, endured excessive violence at the hands of Israeli soldiers during their arrests last month. DCIP demands Israel initiate prompt, transparent and impartial investigations of each incident. On May 24 at 10 a.m. in Tulkarem, four soldiers severely beat Abdel-Rahman after they bound him, according to a sworn testimony from Abdel-Rahman to DCIP. Abdel-Rahman was leaving school when Israeli soldiers spotted him. A soldier got out of the jeep, twisted Abdel-Rahman's arms behind his back and tied his hands tightly with a single plastic cord. He then hit Abdel-Rahman with the stock of his rifle knocking him to the ground. The blow opened an old wound in his stomach. The three other soldiers joined, and they punched and kicked Abdel-Rahman for 10 minutes. His head and right arm were injured. As the soldiers drove him to the interrogation center, they slapped and kicked him. They shouted insults and abuse. At the center, they kept him out in the sun, blindfolded, without food, water or the use of the bathroom for six hours. He did not receive medical attention until two days later, after his interrogation, when he arrived at the children's section of Megiddo prison. On May 15 at 6 a.m. in Nablus, a group of Israeli soldiers beat Anwar while he was walking to work, according to Anwar's sworn testimony to DCIP. Anwar was heading to work at the local vegetable market when he saw a clash between Israeli soldiers and Palestinian protesters. He changed directions to avoid the conflict; however, protesters fleeing the scene quickly surrounded him. He began to run with them, but stumbled and fell. The Israeli soldiers who were pursuing the crowd caught up with Anwar. They kicked him and struck him with the stocks of their rifles. A soldier stomped on his leg until it bled. Eventually, the soldiers bound his hands tightly, blindfolded him, and led him to a military jeep. The soldier took Anwar to the police station. He waited over 10 hours before his interrogation. He did not receive medical attention or food until the next morning when he arrived at the prison. The experience of these two boys is not exceptional. Children suffered physical violence in 76 percent of arrests in the West Bank, as documented by DCIP in 2014. DCIP filed nine complaints last year. One investigation was closed without charge, and eight remain pending. According to Yesh Din, an Israeli human rights group, only 7.4 percent of complaints submitted to the Military Police Criminal Investigations Division lead to an indictment.